one of the two large lymph channels, right lymphatic duct or thoracic duct. 5] M/l) accelerated the rhythmic contractions of the lymphatic duct to 87. Regions of most of the organs lying on or near the midline, such as lungs, diaphragm and heart, follow different pathways either to the thoracic duct or to the trunks feeding into right lymphatic duct (1). Lymphedema occurs when the lymphatic ducts become blocked and a buildup of lymph fluid occurs in the fatty tissues just under the skin, resulting in swelling (Lymphedema, 2004). KEY WORDS: Thoracic duct; Inferior vena cava; Lymphatico-venous communications; Cisterna chyli; Lymphatic duct. 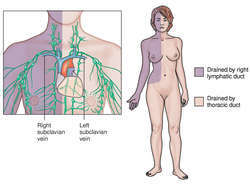 On the right side, the right lymphatic duct enters at the junction of the right internal jugular and right subclavian veins, but this duct only drains lymph from the right side of the head and neck, the right upper limb, and the right half of the thoracic cavity.